Butter Chicken! Is it possible to enjoy healthy butter chicken without compromising on the authentic flavors? Yes!! 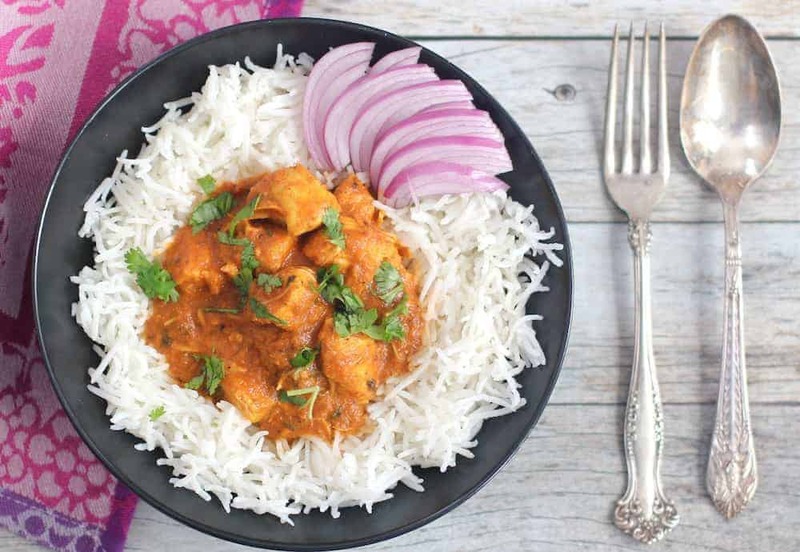 Read on for an EASY authentic tasting butter chicken recipe in your Instant Pot. Punjabi murg makhani also know as butter chicken is one of the most popular Indian dish across the globe. 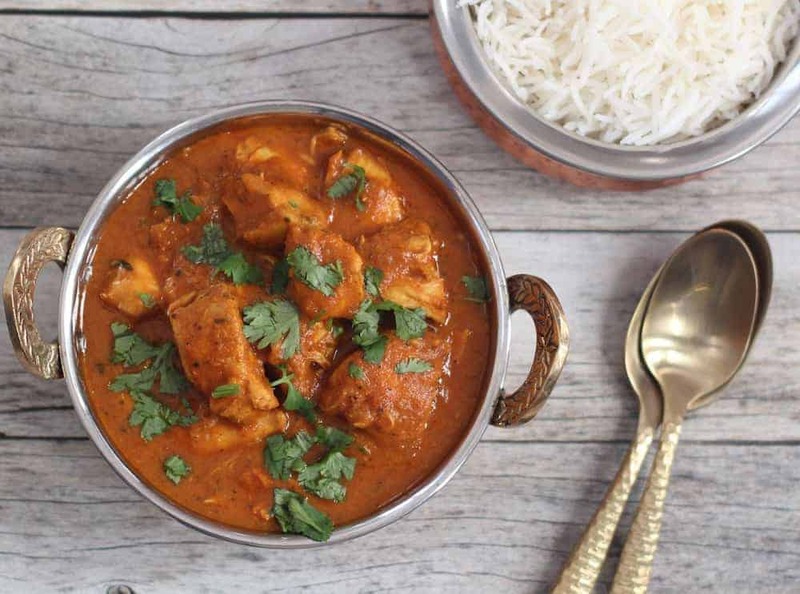 Smoky flavorful chicken, grilled in the tandoor with heavenly aroma of the garam masala and fenugreek, dunked in a creamy sauce with orangish hue from the red chili powder and turmeric – is how I reminisce butter chicken! I recently purchased my Instant Pot/electric pressure cooker and have been loving the one pot cooking experience! Not much clean up, no baby sitting the food and so many healthy dishes that can be cooked in no time. 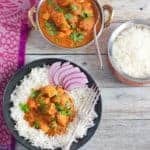 While I was searching for some instant pot recipes, I came across theprimaldesire.com, a wonderful blog with a delicious and healthy recipe for Paleo butter chicken. Not that I am dairy free but looking at the ingredient list, the butter chicken that is usually drenched in butter and cream all of a sudden looked so much healthy and appetizing! The Paleo version using the coconut milk and ghee to get the same authentic creamy taste without all that butter or cream! And to top it off all under 45 mins, no chicken to be marinated or grilled. I have tried the recipe few times and loved it every single time. Thanks to Holley & Raj now I am hooked to this healthy, delicious and most of all quick recipe. I am so excited to post my first Instant pot recipe and thought a video to go with it would hopefully make it easier for everyone to follow this recipe. Here is my easy version of the Instant Pot butter chicken recipe that is now on a repeat list in my house. 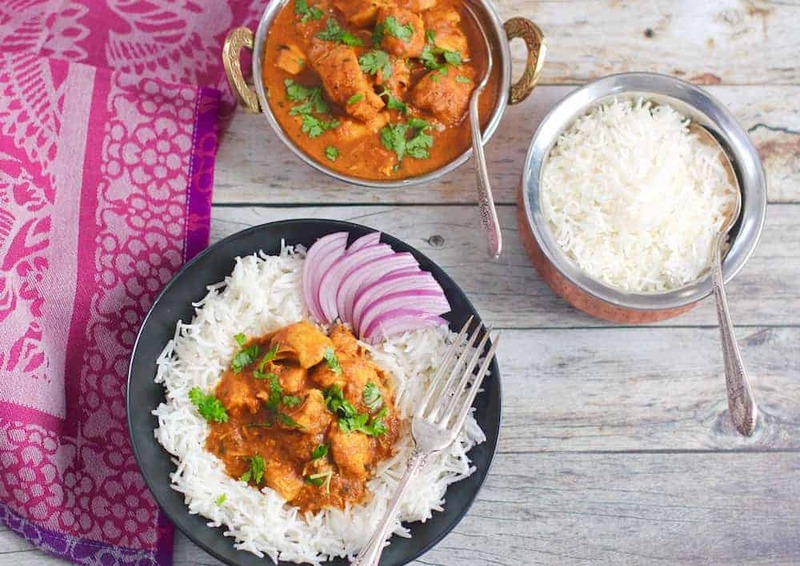 butter chicken -A flavorful chicken with heavenly aroma of the garam masala and fenugreek, in a creamy sauce with orangish hue from the red chili powder and turmeric. Add ginger, garlic, turmeric and red chili powder. Mix well and cook until fragrant for 2 mins. Separate the coconut cream and water. Keep the coconut cream aside. Add only the watery portion of coconut milk and pureed tomatoes mixing with spices. Add chicken and stir well. Open the Instant Pot, stir in coconut cream, tomato paste, garam masala, fenugreek leaves, sugar and half of the cilantro. Add more salt if needed. Turn the Instant Pot to Sauté mode. Cook without the lid to allow the curry to thicken for 5 minutes. If the sauce starts to splutter, set adjust to Saute(Less). ** Add more red chili powder and garam masala for spicer version. Delicious! I’ve never heard of the Instant pot pressure cooker. It sure looks like it cut down on the time. Thank you Loretta! Instant pot Instant Pot does the job of a slow cooker, electric pressure cooker, rice cooker, steamer, yogurt maker, sauté/browning pan, and warming pot. I bough it recently and loving it so far! Thank you Indu! I bought it in November and love it so far. 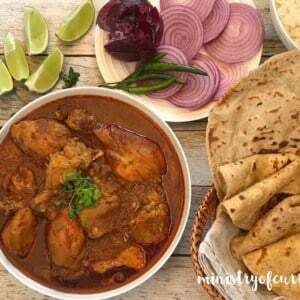 Butter Chicken 🙂 – one of my greatest food-memories and one of my favorite chicken dishes. Your version and presentation look wonderful. Thank you Hans! It is my favorite chicken dish too and I am so glad to have found this healthy and simple version. Wow, looks amazing. Will have to make it soon. Thank you for sharing your recipe. I am about to buy the instant pot too. 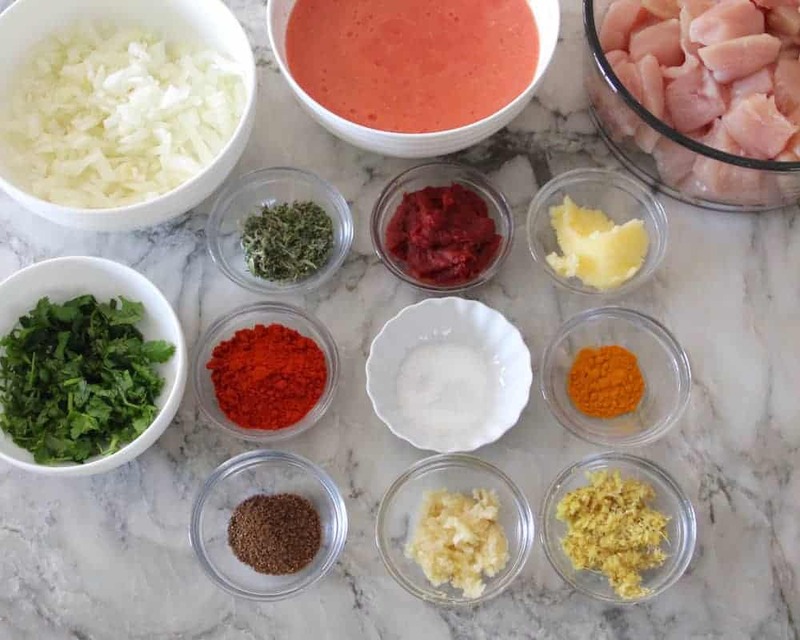 It looks like you can cut down on cooking time.The butter chicken looks awesome! Sandhya, I have not touched my pressure cooker for last 3 months plus its super easy cleanup! I am drooling… and that says a lot from a mostly vegetarian like me. Gorgeous photos and love the new twist on the recipe! Thank you Annika! I am obsessed with the instant pot and all the amazing recipes you can make in one pot. This was absolutely delicious. I will definitely make it again. Thank you Swati! So glad you enjoyed it. To clarify, you don’t use the cream from the coconut milk? Just the liquid? I add the liquid while I cook the chicken. And add the cream in the end with the tomato paste, garam masala etc – in step 6! Let me know how you like it! My husband hates coconut, what is the alternative? How much do I use? Thanks! If you do not like coconut you can use full cream. Or cashew cream – soak cashews in warm water for 20 mins, blend to smooth paste. Cathy, So in step 4 instead of coconut milk, you add 1/2 cup of water. And then in step 6 add 1/2 cup of cashew cream or heavy cream. Thanks so much for sharing this recipe and video for the instant pot! While traveling around India, butter chicken was one of my favorite dishes. I’m not much of a cook, so Indian food has seemed a bit daunting to undertake. Your recipe makes it feel very approachable and I’m hoping for some delicious results this evening. One question, I haven’t been able to find Kashmiri red chili powder. What can work as a comparable substitute? Will it impact the flavor much? Thanks! Hi Margi! So fun that you got to travel India and taste the amazing foods there. You can substitute kashmiri chili with any other mild red chili powder or paprika. It will not impact the flavor. Kashmiri chili powder is very mild but gives a beautiful orangish color to the curry. Probably my favourite Indian recipe, which I think it’s actually not really indian and just a westernised thing haha do you know if it’s true? Butter Chicken is an Indian dish, although made mostly in restaurants. I made this tonight – so delicious! I followed the recipe to the letter, except I didn’t have tomato paste on hand so I left that out, but I didn’t miss it at all. The only problem was that instead of taking 35 minutes, it took over an hour and a half! I don’t know what I’m doing differently or wrong that it took an hour longer than specified. The time for my Instant Pot to come up to pressure and to slow release was a really long time, so long that I eventually just did a quick release after about 20 or 30 minutes because we were so hungry. I didn’t watch the video so perhaps there are time saving tricks in there. But the chicken was fall apart tender and everything was delicious, even my toddler loved it. Great recipe! Hi Sundari, So glad to hear that you enjoyed this delicious butter chicken. Do you have a 6QT IP or a 8 QT IP? I have a 6 QT one. Also as the recipe specifies you can do quick release after 5 mins of NPR. That would reduce the time. Thank you for your detailed feedback it always helps me to know if I need more detailed instructions, etc. Also If you enjoyed this sauce you might also like the Malai Kofta that uses the same sauce. I’ve never used coconut milk before as I don’t really like the taste of coconut on its own, but I’d like to try this as written before I start substituting if necessary. Silly question, but can you tell me how to separate the milk from the cream once it’s been in the fridge? Leave it in the can or put it in a bowl? Then just scrape (?) the cream top off? Thanks for any guidance. Hi Donna! So happy that you want to try this recipe. So you leave the whole can in the fridge. When you open it just scrape the top layer of cream off, which is almost 1/3 of the can. You keep this cream aside to put in the curry in the end. Use the remaining watery portion to cook the chicken. Also remember to use full fat coconut milk. Thank you, I’m looking forward to giving it a go later in the week. Full fat coconut milk is purchased and ready to go in the fridge. I’m sure this will be delicious. Your aloo gobhi is a staple for me and I appreciate you sharing your recipes. Thanks!! Please let me know! I am so happy you enjoy the aloo gobhi, it’s simple yet delicious ? Hi I do not have fenurek leaves and plum tomatoes, I have regular tomatoes can I use that? Is there a substitute for fenurek leaves or can it be omitted? Hi Nina, you can use any regular ripe tomatoes. And yes fenugreek leaves can be omitted. Let me know how you like it! Looks delicious! Would you change the cook time if using boneless skinless chicken breast instead of thighs? Hi Nishi! Check the detailed recipe. Basically with chicken breasts you want to do 5 min cook with 5 min NPR. Let me know if you have any questions! 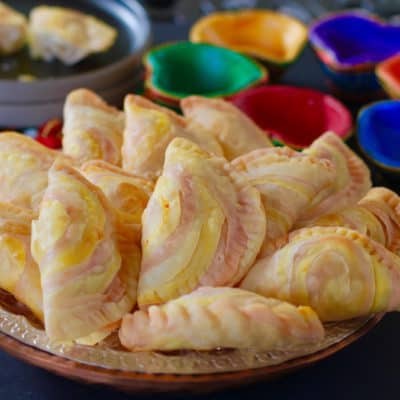 Easy recipe but very tasty. Saved it. Will definitely make it many more times. As you have suggested earlier maybe substitute cashews for coconut milk. (You see coconut sometimes causes heartburn!!!). 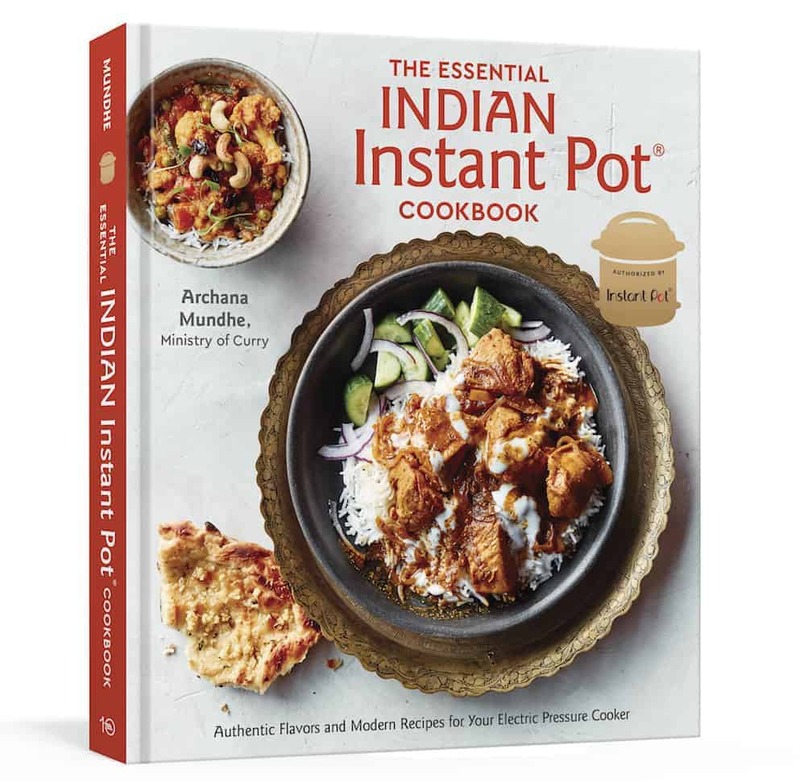 BTW Archana I did not find this listed under the Instant Pot recipes tab instead I had to search for it. I think all your posted Instant pot recipes are not populating under that tab or am I mistaken??? Actually sorry about that-it is listed under the Instant pot recipes. Happy that you found it. I do have to keep updating the Instant Pot recipes pages, so you are right that sometimes the newer recipes might take some time. Hi Kalyani! So glad you tried this recipe and enjoyed it. It is so much healthier than the traditional version yet tastes so authentic. Just had to tell you how much we enjoyed this recipe! I have made many versions of butter chicken and this is by far my favourite! I made your chciken biryani last week and that was a huge hit too! I would add more chciken next time as I have lots of sauce left over but it will be put to good use! I stumbled upon your site locking for an biryani recipe and ended up making the butter chicken and homemade ghee instead! The family was incredibly happy and this will be a regular. So happy to have found you! Hi Kate! Thank you for this lovely comment. It made my day!! Ghee and Butter chicken are on a repeat for us too. I love the authentic taste of butter chicken without any cream or butter. And you must try Chicken Biryani, it is my other popular recipe and is DELISH! How much coconut cream are you adding near the end… I don’t see that in your list of ingredients. Thanks! 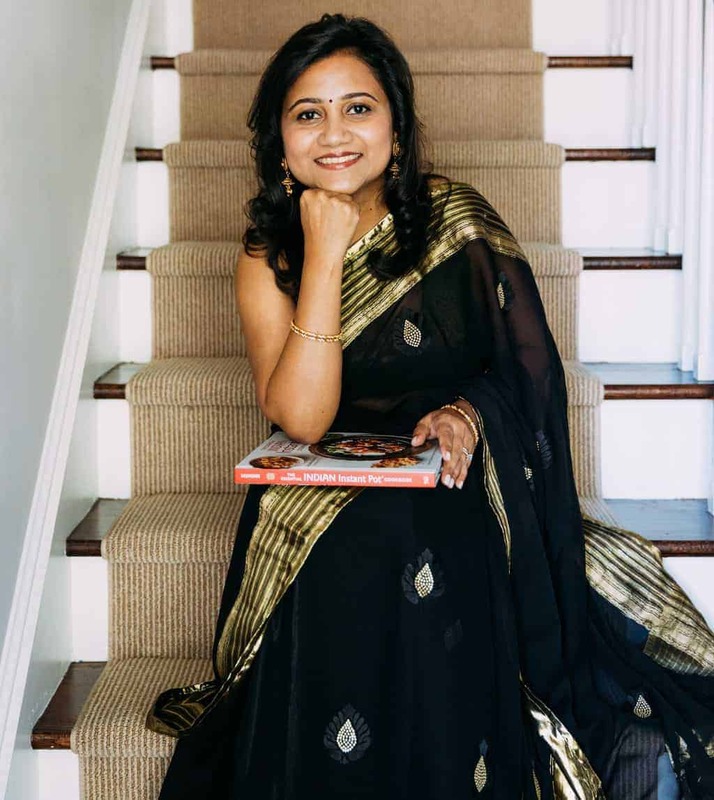 Hi Archana – I made this last weekend and it turned out excellent! Thank you so much for the recipe. I’d like to prepare it for a dinner party and thinking of making 6 lbs of chicken. Have you ever tried to cook that much at one time? Think it’s safe to just triple the ingredients and follow the recipe? Hi Nina, I have doubled the recipe so far but not tried 3 times. What you can do is not add the third can of coconut milk/liquids. Just add 2 and see if you can fit the chicken so it is not more than 3/4th full. I think it should work. All the timings will still remain the same. Let me know how you make out with this. Thank you for your feedback Radha! Makes me so when when kids enjoy these healthy home cooked meals. 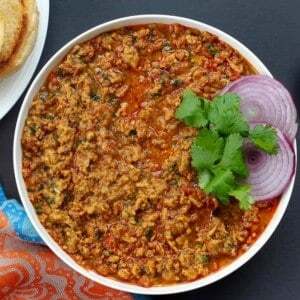 Hi, does it make a huge difference in flavor if I leave out fenugreek leaves? Hi Archana! You can leave out the fenugreek leaves. It will not make a huge difference. Hi Masooma! You made my day!! Thank you for your feedback. So happy to hear that your family is enjoying this healthy version of butter chicken. Can’t wait to hear how you like the malai kofta. Hi Archana, love all your receipes. Saw the video of butter chicken. I’m planning to make it in IP but the only thing I do like is the QPR technique. Is there another option for it. If I do NPR after 8 mins of cooking I guess the chicken will get over cooke, by the end of cooking it for additional 10mins after adding tomato paste. I don’t want chicken to be chewy when it’s done. Hi Shilpa pressure cook for 5 mins and then 5 min NPR works perfect! Hi Archana, made it as a pot luck dish for my co workers. They all loved it in fact beyond that. Thank you very much for your awesome recipes. Quick question can I use the same recipe to make butter panned dish. put kale in it! Thanks, Archana, for another delicious and quick (and healthy!) recipe for my family. Thank you for your lovely feedback Stacy! I am so glad your family enjoyed this healthy and authentic tasting butter chicken. Hi Archana! This has become a favorite for my family and I am making it for a crowd this weekend 🙂 For 4 lbs chicken, do i keep the cook time the same? and do i simply double all the other ingredients? TIA. Happy Holidays! Hi Masooma! I am so glad you are enjoying this recipe. You can double all ingredients, increase saute time but same pressure cook time. Great recipe!!!!! Thank you for sharing. Made it today but didn’t have any tomato paste handy and still turned out great. Which tomato paste do you use? Hi Vibha! So glad you enjoyed this recipe. I use hunts or trader joe’s tomato paste. Hi Sapna, So glad you enjoyed it. And yes the recipe is pretty versatile, you can def use milk and cream. This was delicious!! This was my first time making this dish and the recipe is a keeper. We didn’t have fenugreek so we used regular curry powder I had on hand. I had my husband only put in one tablespoon because I didn’t want it to be overwhelming for him and he liked it. We added salt while we were eating it and other than that, the flavor was perfect. Thank you for posting this recipe. Thank you for your lovely feedback. So Curry powder and fenugreek leaves have different flavors. You can also skip fenugreek leaves and it is more of a garnish. My 12 year old says this recipe is excellent and ate the butter chicken for 5 days in a row. I’m vegetarian but have made this multiple times and in fact was the first non-veg recipe and first IP recipe I made. Very easy. Thank you! Thank you Sapna! Best compliment I could get, so happy that your son enjoys this. Next time I’m doubling the recipe. Made it with plain Basmati rice. Hi Tammy! Thank you for your lovely feedback. 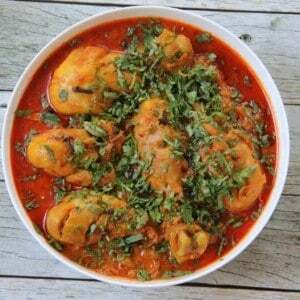 If you are looking for a potato dish, you must try my dum aloo!! It is to die for. Hi Archana, My son loves butter chicken so planning to try this recipe this weekend. If i was making 8lbs of chicken- would I still only pressure it for 8 minutes or do I now need to pressure it for 32 minutes since I am quadrupling the recipe and cooking 8lbs of chicken instead of 2lbs? Hi Sherrita, Pressure cook time remains the same. It will take longer time to come to pressure. Make sure you deglaze the pot really well after sautéing the onions with the water from coconut milk. Also do you have a 8-qt Instant Pot? Yes I bought the 8 quart. Thanks! Hi Archana.. I’m planning to make this for this weekend. Could you please let me know how to make the tomato paste? Hi Rupa, tomato paste used in this recipe is store bought and used to give the curry the bright red color. It is sold in small cans in grocery stores. You can also skip the tomato paste if you do not find it. Tomato paste is made by reducing tomato sauce over medium, then low heat as it thickens whilst stirring almost constantly. It is a slow and lengthy process when done on stovetop (in the industry, it is done in autoclaves). It takes a fantastic amount of tomatoes to end up with a relatively small quantity of paste. It is much faster (and cheaper) to buy a small can of paste at the grocery store. Some brands do not add salt nor sugar and are definitely worth it. Agree! Thank you for the details. I agree that small cans are cheaper and faster. I usually use a dried coconut milk powder and mix it on my own to either thick or thin consistency, depending on the recipe. So can I pressure cook the chicken in some plain water mixed with the tomato purée first and then add thick coconut milk later? How much water would you recommend I use? And how much thick coconut milk? Hi Dhanya, You can use 1/2 cup of plain water to cook the chicken. Add tomato paste and the 1/2 cup of thick coconut milk after the pressure cooking cycle completes. You can add another 1/4 cup of thick coconut milk if needed. Note – I have not cooked using dried coconut milk powder. Sorry hit send too soon. Do let me know how it comes out. Very interested to know how coconut milk powder works. Hi Archana – I just made this and its amazing! We devoured till the last bit! Never made butter chicken this good, it’s better than restaurant ones. I just followed your recipe. Thank you so much! Can I double the recipe if I have the larger IP (8 quart) and do I change any of the timings? Can I use heavy cream instead of coconut milk and if so how much? You can replace heavy cream with same amount or more as that of the coconut cream. Creamy butter chicken is the best! Love this recipe! Wanted to make it tonight but only have thighs and drumsticks with bones. Do you think I can still make it? If so, Would I need to adjust the cooking time? Hi Tanya! Yes, absolutely. Pressure cook for 8 minutes, followed by 5 min NPR. It will work perfect. Thank you so much. We loved this recipe. I slightly modified this recipe. Before frying the onions, I added whole garam masala,cumin and coriander. Also, after onions turned golden brown, I lightly fried the chicken pieces. Then added the tomato , coconut water mixture. Because the breast pieces were already fried, I kept the manual timer to 3 min and then 3 minutes of QPR. Thank you for the tips on adding the creamy coconut and tomato paste later. Thank you again. Have a great festive season ahead. Thank you for your detailed feedback. I am so glaad you enjoyed this recipe. And it was a good idea to reduce the pressure cook time to 3 mins. Please tell me if I can substitute fenugreek leaves with whole fenugreek or even curry leaves, and if so, how much? Just tried this recipe for the first time and my family loved it! New to instant pot – I often have frozen chicken breasts or thighs – how long should I cook or is thawed best to use? I am sooooo excited to try this! One question, if I wanted to add something like frozen peas and carrots (like the little chopped up frozen ones in a bag), when during the process would I do that? Would they overcook and turn to mush if they were in during the pressure cooking?